Yosemite National Park has some of the most stunning landscapes in the world. This four title Map Pack Bundle helps explorers of all levels see everything this astounding park has to offer. 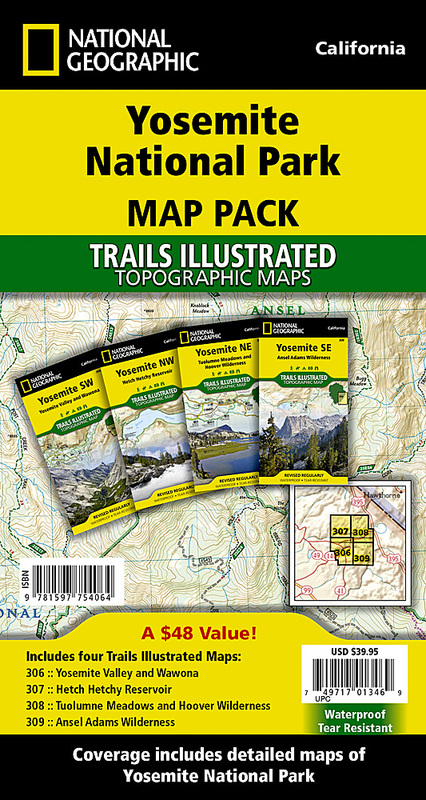 The maps offer detailed views of each area of the park from Yosemite Valley, to Tuolumne Meadows, the Ansel Adams Wilderness and Hetch Hetchy Reservoir. Each map offers an enlarged view of a specific portion of the park. With all four maps visitors are ready for just about anything, from a day hike in Yosemite Valley to a multi-day packback adventure in the backcountry. Each trail and road has been carefully researched with the help of the National Park as well as other public land management agencies. The trails include mileages between intersections.